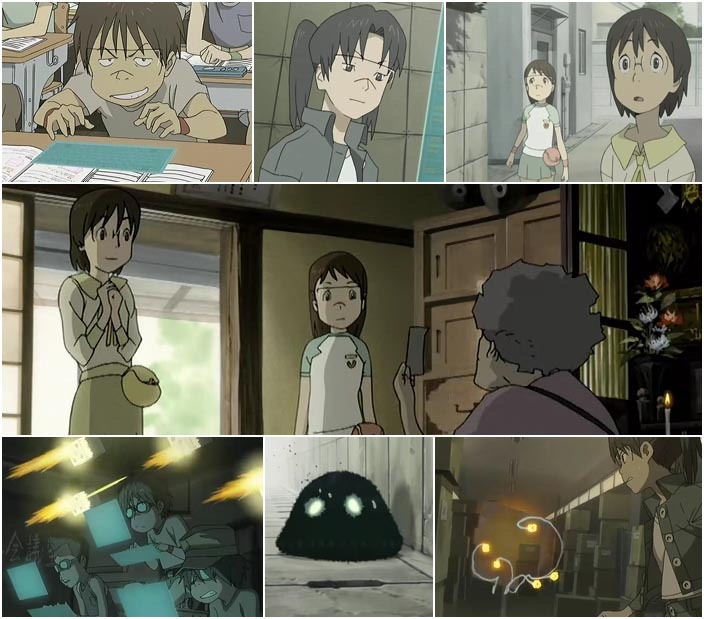 Dennou Coil centres around a group of children living in the future where the lines between the real world and virtual world have become blurred. By wearing a special set of glasses, the user is able to see a virtual recreation of their surroundings, updated in real-time, along with added virtual elements such a virtual pets, software glitches and viruses. Yuko Okonogi (Yasako to her friends) and her family have just moved to Daikoku city and when it comes to the virtual world, Yasako is fairly naïve as she’s never really stepped beyond the realms of an average user. But all this changes when Yasako’s virtual pet dog, Densuke, goes missing and she is forced to employ the help of Fumie. Fumie immediately begins exposing Yasako to aspects of the virtual world that she was never even aware of, let-alone can comprehend, as they rescue Densuke. To further compound matters, Yasako’s crazy grandmother, Mega-baa, recruits Yasako into her cyber detective agency. It turns out that Fumie also works for Mega-baa and that Yasako will now become Fumie’s partner. As Yasako is exposed more and more to the side of the virtual world she never knew existed, she finds herself being sucked deeper and deeper into a conspiracy involving the manufacturer of the glasses – a conspiracy so large that it seems to drawing those around her in too. There are obvious influences in this series like Ghost in the Shell and Serial Experiment Lain to name the predominant two but this does not make Dennou Coil derivative in any way. In fact the storyline is largely original and very innovative even if it does echo a few minor similarities in theme or plot-device. The character development was first-class. It’s a rarity in any medium these days to see or read anything where the writer takes the time to let the viewer/reader really get to know every single character including the lesser important ones. This in itself would be reason enough to watch Dennou Coil. The artwork is definitely worth a mention here. The artists went for a more realistic look (a style not that common in anime). I’m not going to start saying one style is better than another because that would be untrue but for this series it was the perfect choice and no other art style would have worked half as well. As for the animation itself, many of the scenes were filled with lots of movement giving it a really great feel. I won’t moan about CGI use, in fact for once I’ll even go so far as to complement it because it actually worked extremely well and did not clash with the hand-drawn animation at all. As for the soundtrack, it was satisfactory but nothing particularly note-worthy. I will say though that it went well with the atmospherics and as far as atmospherics go, Dennou Coil nailed it perfectly. My overall impression of Dennou Coil was a very positive one. It’s clever, funny and rather philosophical all in all. This is definitely an anime that I’d highly recommend to anybody who enjoys sci-fi although I think most demographics will walk away glad that they watched it. It’s on my list of favourite anime and without a doubt worth adding to your DVD/BR collection. This entry was posted in O-Blogive, Otakudom and tagged Coil, Denno, Denno Coil, Dennou, Dennou Coil, Isako, Yasako on February 4, 2010 by nonzyro.